Die casting is a metal casting process where molten metal is forced into a mold cavity. We have worked on several projects in this field together with our partner Flow Science, the makers of FLOW-3D. For this case study, the shape of a die casting component was optimized. 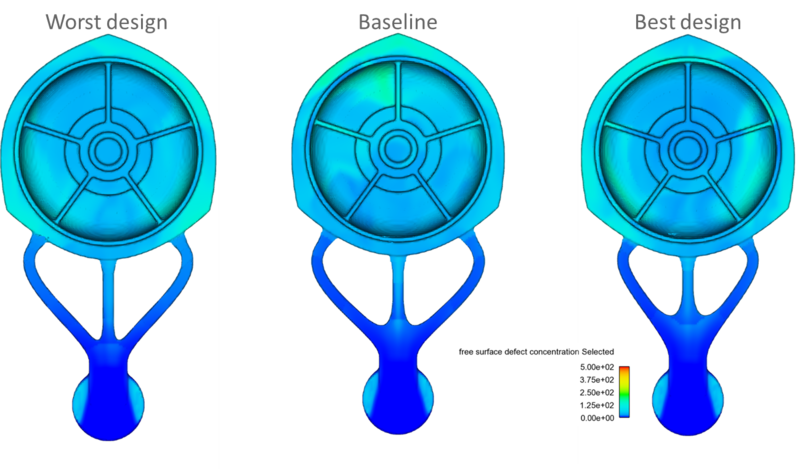 The parametric model – created in CAESES® with a set of 8 shape parameters – was coupled to FLOW-3D to calculate the relevant flow quantities which are used to define objective functions. 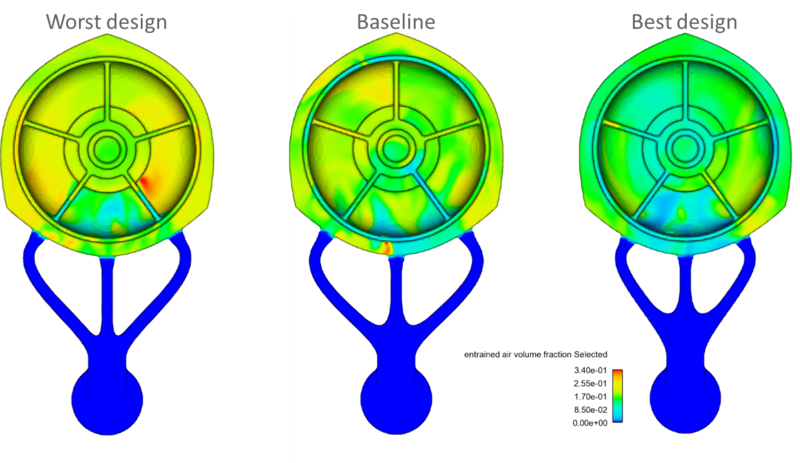 The main goal of this study was to reduce the overall entrained air volume. At the same time, the free surface defect concentration (these surface impurities arose from oxide formation on the free surface) should not be higher than for the baseline design. For this purpose, a fully-automated workflow was set up where CAESES® optimization strategies were used to generate and analyze different design candidates. The initial baseline geometry was imported into CAESES® and a parametric model was rebuilt. 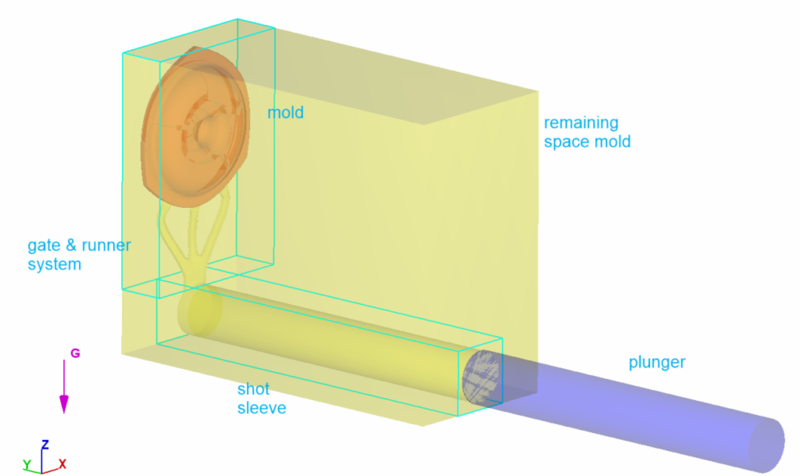 The mold, runner and shot sleeve geometries were subtracted from a solid domain to produce a watertight flow domain that could be readily meshed in an automated workflow. The velocity in the gates needed to be in the range 20-60 m/s. The gates should be fed by the runner system at the same time. All defects should go to overflows. The fast shot started when the metal hits the gates. The flow should also run from thin to thick sections, using the shortest route. The FLOW-3D setup was created once for the baseline design. Through the software connector of CAESES®, this setup could be automatically re-used for all new design candidates. Everything from material properties to number of mesh elements and density could be controlled by CAESES® during the investigation. The result data from FLOW-3D was automatically transferred back to CAESES® and used for calculation of objective functions. A non-conforming mesh type was chosen with 2 blocks. The total number of real cells was around 1.400.000 with a cell size of 2 mm. For the plunger, the material CuCuBe (Copper Die) was used which has a thermal conductivity of 300 W/(mK) and where density * specific heat is 3.52*106 J/(m3K). 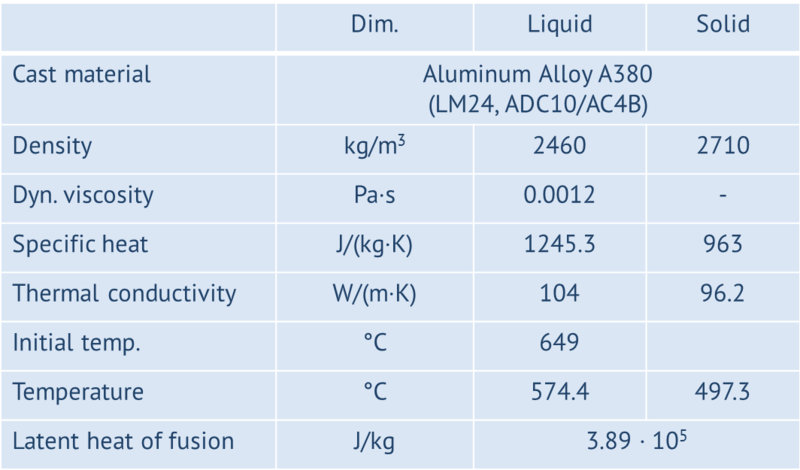 For the remaining space mold, steel H13 was taken, with a thermal conductivity of 28.6 W/(mK) and where density * specific heat is 3.56*104 J/(m3K). The maximum thermal penetration depth is 14 mm for this material. The optimization was divided into two phases. In level 1, the basic flow quantities were optimized. The speed during the fast shot was varied in the range 1.5-2.5 m/s (baseline: 1.6 m/s). The casting fluid temperature was also studied and varied from 620°-680° (baseline: 649°). After this initial optimization phase, the level 2 phase started. In this phase, the shape parameters were allowed to vary within an automated optimization. For the design and shape optimization of casting components, CAESES® is your ideal tool. Geometry modeling, CFD coupling and optimization – all in a single solution. FLOW-3D is easily coupled to CAESES®, but any other simulation package can also be integrated. Just let us know if you have any questions.